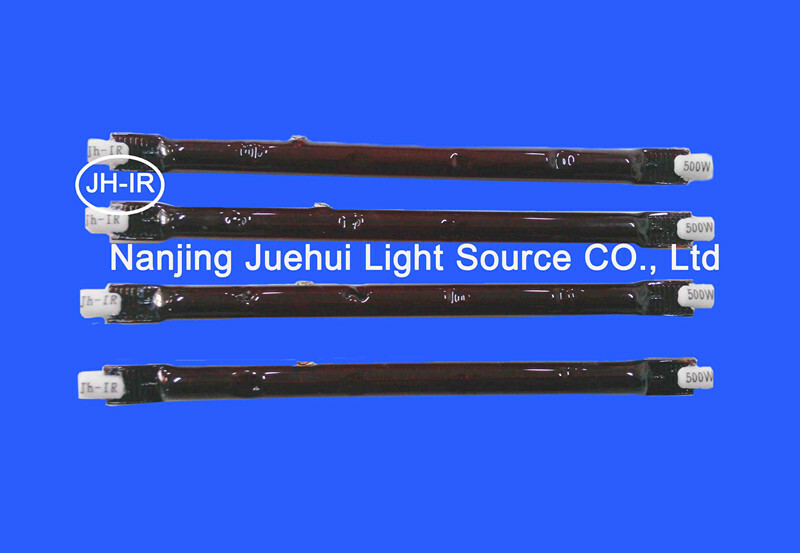 Welcome to Juehui Light Source ! 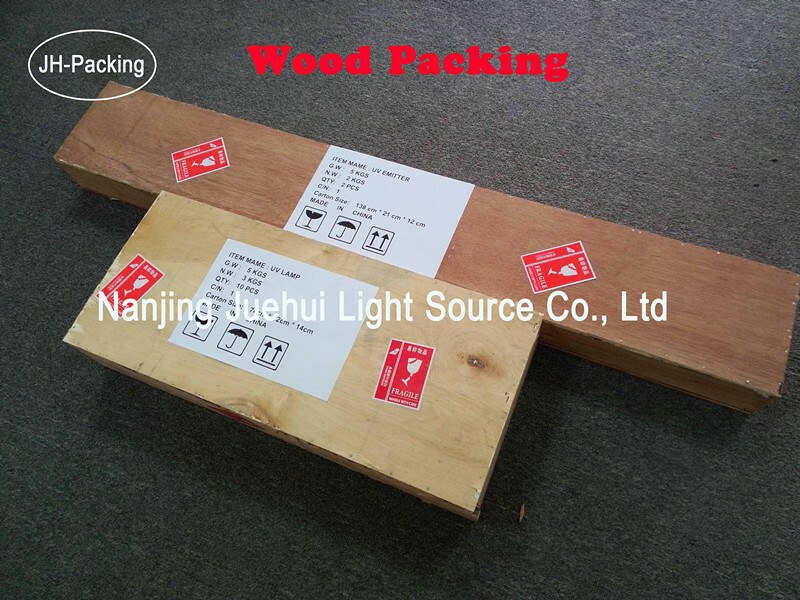 Please allow me to introduce our hot product : Infrared Lamp. 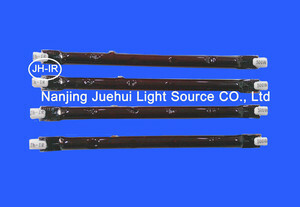 Twin tube IR lamp with gold reflector with high temperature resistance nickel wire cover by ceramic beads. 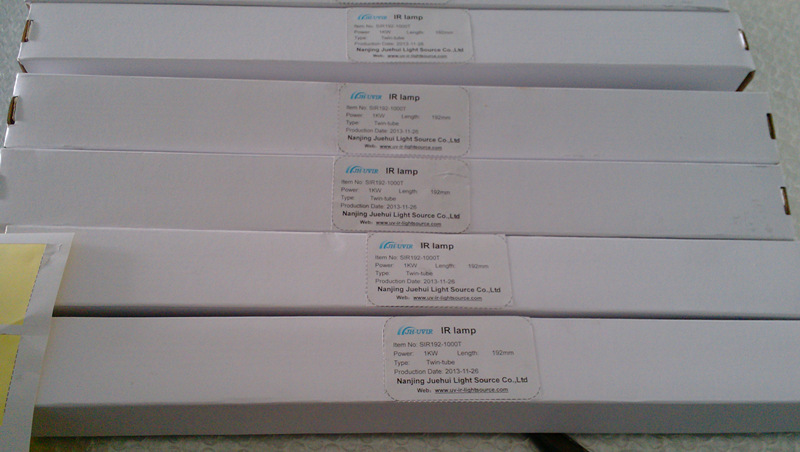 We can offer infrared lamps which by virtue of a gold reflector can emit heating sources directly to the product. A gold finishing on the infrared lamps reflects the infrared radiation. Consequently, Much more infrared radiation is absorbed by product. 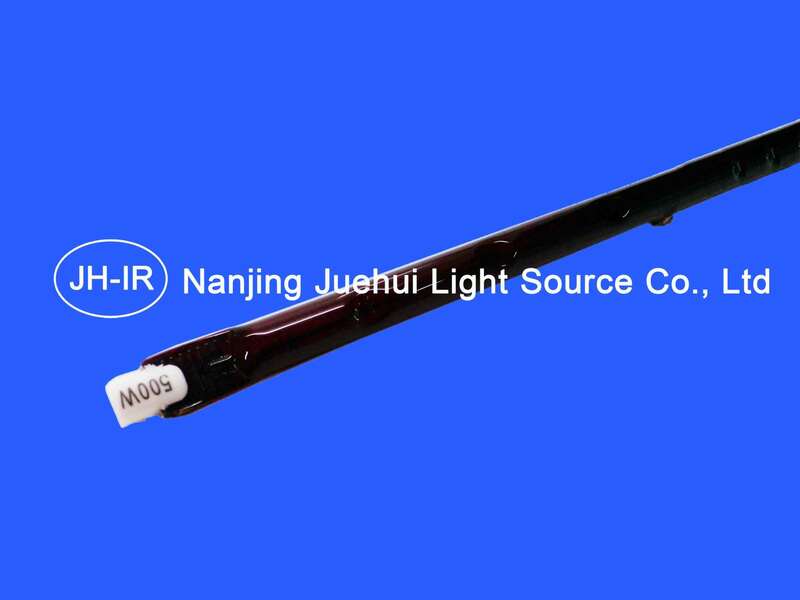 IR heating lamps from Nanjing Juehui Light Source Co., Ltd cover the whole IR range. infrared short wave (SW), infrared fast response mediumwave(FMW),infrared medium wave (MW), infrared carbon medium wave (CMW).By choosing the correct spectrum for you production can give you shorterheating time, higher production rate and more energy saving. 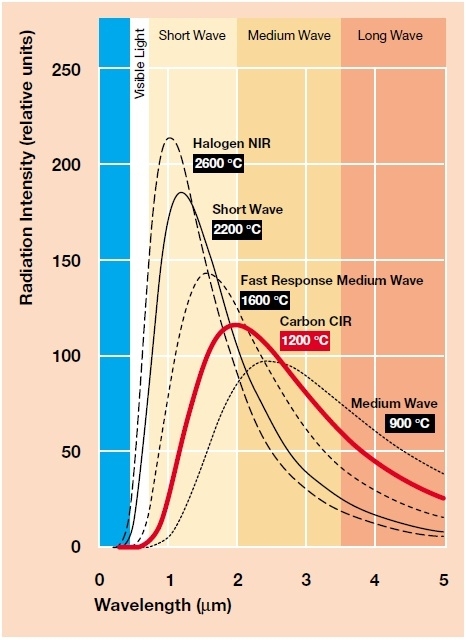 Short wave infrared radiation has high heating power. 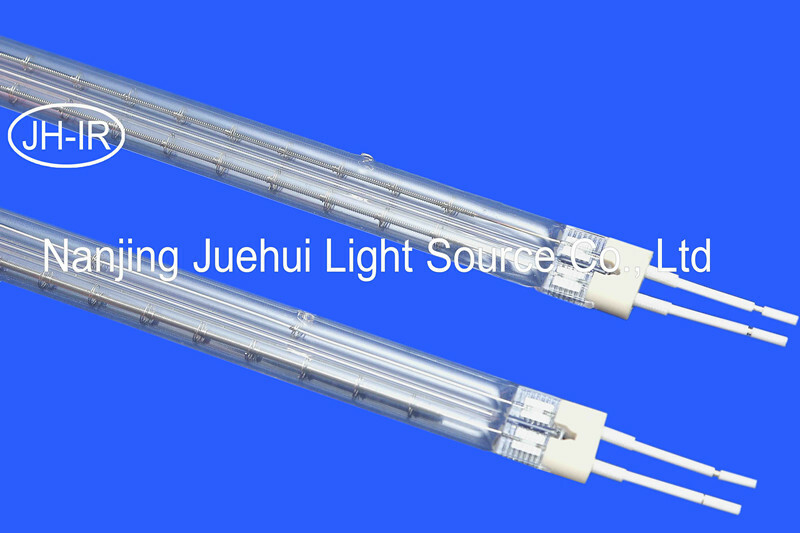 Short wave lamps areparticularly well-suited for processes that require quick start-up andshut-off, since they achieve their full operating efficiency within seconds.Juehui Light Source has designed infrared heaters in the highly stable andapplication-proven twin tube format. 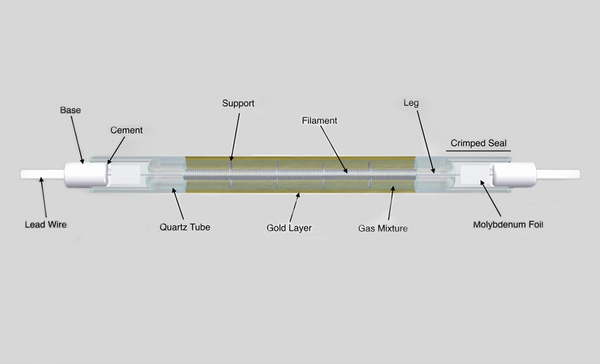 Twin tube lamps are notable for their highradiation density and high power intensity. 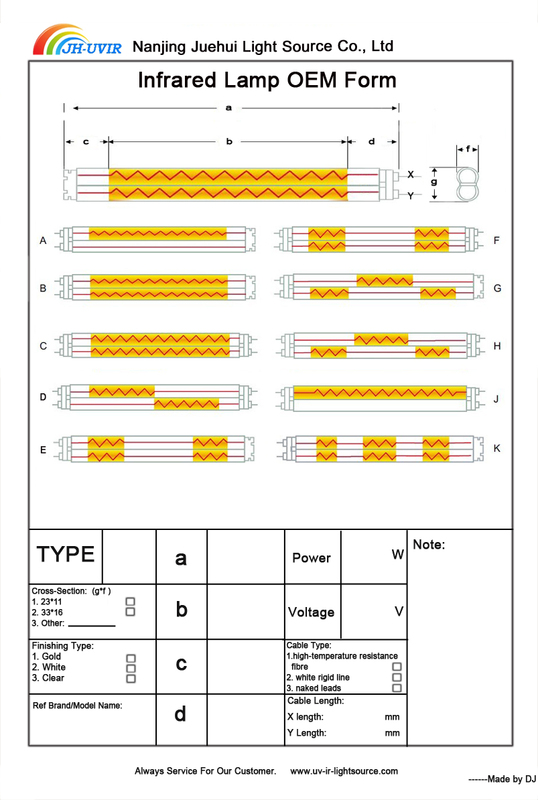 5,Heated lengths up to 40"
Abbess - Adnos - Advancing Aetec - Agfa - Aktilux - Amba- American Ultraviolet - Amjo - Aquatron - Aradiant - Argo Argos - Barberan -Beltron Berkey - Brewer - Burgess-BLV Cefla - Chambon - Colight - Colodry-Comco - Dinippon Distrilampe - DPL - Dubuit Dupont - Elsemann - Eltosch EYE -FDS - Gallus - GEW - Giardina - GS - Happa - Hackermack- Hanovia HonleIdealquartz - IST - IVT Iwasaki - Japanese Storage Battery-Kuhnast Kammann -Klemm - Kopack - Lignacon - Mark Andy - Muller - Natgraph Nilpeter - Nolle -Nuarc - Offset - Olec - Osmo - ORC Parker - Philips Polytype - Primarc -Printconcept - SPS - SPE - Sanki - Schneider- Screen Serifasp - Spectral Starna- Svecia - Steinmann - Superfici - Sutter Siasprint - Technidry - Technigraf -Texel - Theimer - Theim - Van Keulen Uviterno - UV Products - UV Technology -UV Systems - Ushio - Van Dam Wallace Knight and many more..